Looking for a tasty and unique grilled cheese recipe? 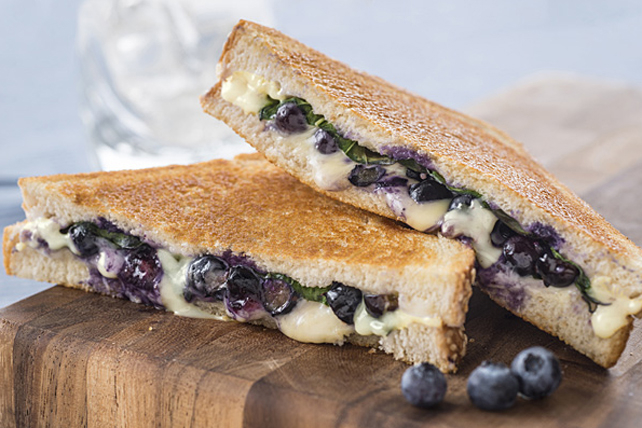 Our Blueberry-Basil Grilled Cheese features fresh blueberries, basil and melted Swiss cheese nestled between toasted crusty French bread slices. Try it as part of your breakfast! Top 1 bread slice with blueberries and basil; cover with Kraft Singles and remaining bread slice. Prepare as directed, omitting the basil, and substituting 1 Tbsp. blueberry jam for the fresh blueberries. Serve with a cold glass of milk or cup of hot tea. Prepare using your favourite bread, or whatever bread you happen to have on hand.